Radio 104 Fest is Back! 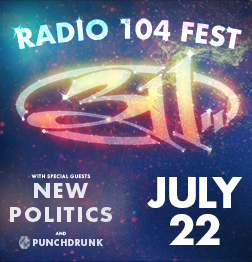 2017’s Radio 104 Fest featuring 311 with special guests New Politics is coming to the Connecticut Convention Center on Saturday, July 22nd! *Silver VIP Package includes: One VIP area admission, early entry, one pair of 311 socks, embossed enamel 311 pin, and one early entry wristband. **Gold VIP Package includes: One VIP area admission, early entry, one screen print poster (limited edition Summer Tour 2017), one pair of 311 socks, embossed enamel 311 pin, and one early entry wristband.